New Zeal has discovered direct evidence linking suspected "terrorist" Marama Mayrick with both the Wellington anarchist community and the Mexican Zapatista revolutionaries. I have maintained in this blog that there is a tie up between Tuhoe radicals, Wellington anarchists and the Mexican Zapatistas. The naming of Marama Mayrick completes the triangle. Meyrick knows Tame Iti from her early days in Whakatane. 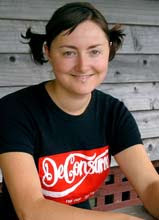 She has also been connected by TV1 to the Wellington "community house"-128 Abel Smith Steet Wellington, that is a hangout of the Wildcat Anarchist Collective. Now comes proof that Mayrick has been financially supported by Collective members in a project involving the Zapatistas. A few years ago Marama Mayrick studied art and design at The Learning Connexion in Wellington. 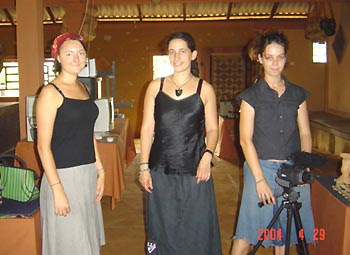 According to TLC's newsletter, August 2004, Bailey has been involved since with friends Emily Bailey and Kate Logan in an international film project. I was questioning whether making art was the best use of my time. I decided to put down my tools and travel for a while. I also wanted to try to fulfill my idealistic dreams of saving the world. Our documentary, based in Wellington is called 'Kotahi te Ao'. It means 'There is one World' in Maori, and this project will take me to five continents, and over 20 countries in just nine months. The film aims to inspire and empower people to make positive change. To renew hope in the belief that it is possible to live sustainably on this planet, and to show that many people are already doing so with great success. ‘Kotahi te Ao’ is open to submissions of work and ideas. I travel with two other Wellingtonians, Emily Bailey and Kate Logan. We have filmed places of destruction and poverty around the world such as the Three Gorges Dam in China, slums in India and the effects of war here in Israel and Palestine. We are focusing the two hour documentary on working solutions though, like social movements of the coolies in India, grassroots environmental groups, ancient knowledge of hill tribes in Thailand, and direct action around the world. We have heard the most amazing stories of painful losses, but also inspiring successes. The website of Mayrick's film Kotahi te Ao is very interesting, particularly the sponsorship page. Sponsors of the project include former Green Party MP, Mike Ward-a well known jeweller. Val Morse is a well known Wellington protestor and anarchist and is believed to be the librarian at 128 Abel Smith Street. Sam Buchanan is a well known member of the Wildcat Anarchist Collective and apparently resides at 128 Abel Smith street. WSF probably refers to World Social Forum, a regular international radical/anarchist/Marxist gathering. The 2005 WSF was held in Porto Alegre Brazil in January 2005. MST probably refers to Brazil's Marxist oriented Landless Worker's Movement, which specialises in illegal peasant occupations of large estates. "Zapatistas in Oventic" speaks for itself. For obvious reasons of security it is strictly forbidden to photograph the people at the Zapatista Caracol of Oventic. If Marama mayrick was actually able to film in Oventic, it would show that she had the trust of the Zapatistas. A viewing of "Kotahi te Au" might answer that question. Trevor, you googled her. thats all. Well you're reading it aren't you-and about 400 others today. can you do a profile on me too? I've been in the anarchist community for years now. Oh and this Mike Ward dude, ... how is he still walking the streets as a known jeweller?! Showing his jewels to people! THIS MUST BE STOPPPED! Send me your name anon and i'll see what I can do. you should look up chris bright, he's filthy commie scum like the rest of them. All I know is that he distributes their zines and is often taking photos at their rallies, and he's a film student in auckland. Man you're a crack up Trev. image suppression trev. you break the law again. take that photo down. you should know which one by now.